Light is a wonderful medium for carrying information. Unfortunately, the size and performance of photonic devices are constrained by the diffraction limit. Recently, however, scientists have been working on a new technique for manipulating optical signals through nanoscale structures. The oscillations of electrons at the surface match those of the electromagnetic field outside of the metal. 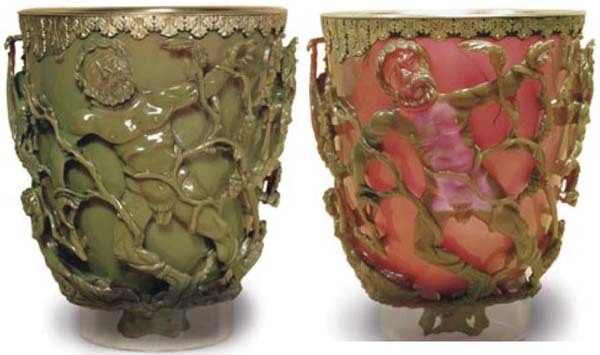 For example, the below Roman goblet from the fourth century is normally green. However, when a light source is placed inside, the color changes to red due to the plasmonic excitation of the metallic particles within the glass matrix. Following the same principle, it has been proposed that a 'spaser' could generate stimulated emission of surface plasmons (oscillations of free electrons in metallic nanostructures) just as a laser generates stimulated emission of coherent photons; this could be done by resonating metallic nanostructures adjacent to a gain medium. We have showed recently that 44-nm-diameter nanoparticles with a gold core and dye-doped silica shell allowed us to completely overcome the loss of localized surface plasmons by the gains to realize a spaser . Plasmonic effects in thin film inorganic solar cells enhancing light absorption and photocurrent generation have been demonstrated and could significantly reduce the materials cost [2,3]. Based on this idea, we demonstrated plasmon-enhanced light absorption, photocurrent, and efficiency in both liquid- and solid-state dye-sensitized solar cells . M. A. Noginov, G. Zhu, A. M. Belgrave, R. Bakker, V. M. Shalaev, E. E. Narimanov, S. Stout, E. Herz, T. Suteewong, U. Wiesner, "Demonstration of a spaser-based nanolaser", Nature 460, 1110-1112 (2009). M. D. Brown, T. Suteewong, R.S. S. Kumar, V. D'innocenzo, A. Petrozza, M. M. Lee, U. Wiesner, H. J. Snaith. "Plasmonic Dye-Sensitized Solar Cells Using Core-Shell Metal-Insulator Nanoparticles", Nano Lett. 11 (2), 438-445 (2011). A metamaterial is an engineered material, i.e. an artificially structured periodic material, whose electromagnetic properties are determined by their subwavelength building blocks. These blocks are usually composed of tailored micro- or nanostructured metallodielectric materials. In 1999, Pendry predicted that engineered artificial material would have unusual magnetic responses . Following his work, much effort has been devoted to metamaterials design and fabrication for obtaining interesting optical properties, including unlimited imaging and cloaking. However, the fabrication of three-dimensional metamaterials shown below is still challenging. 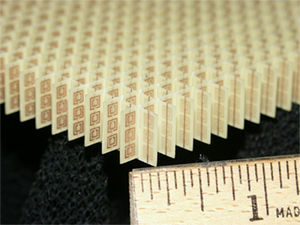 Metamaterial fabrication is challenging because current metamaterials fabrication techniques rely highly on top-down lithographic approaches . Our strategy for metamaterials fabrication is to utilize block copolymers as templates. Block copolymer self-assembly has emerged as a useful designer tool to create nanostructures including 3D continuous morphologies of disparate materials like ceramics  and metals . 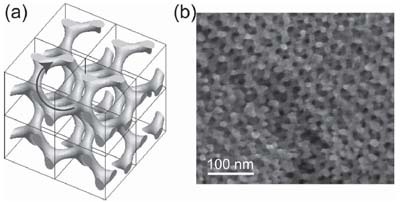 Selective etching of nanostructured block copolymers yields porous templates and metals can be deposited into the porous templates as shown below. We predicted that double gyroidal metallic materials will have negative refractive indices in visible and near infra-red regimes  and the coupled surface plasmon resonance shown below induces the unusual optical behavior, where the blue arrows correspond to the surface plasmon. We further predicted the left/right-handed circularly polarized light propagations in gyroid networks. Each chiral gyroid network allows its own circular polarization as shown below (the magnetic fields are represented by the green arrows). In collaboration with the Steiner group at Cambridge University, alternating gyroid gold metamaterials were synthesized and their optical properties were studied experimentally and computationally . J. B. Pendry, A. J. Holden, D. J. Robbins, W. J. Stewart, Microwave Theory and Techniques, IEEE Transactions 47, 2075-2084 (1999). Costas M. Soukoulis and Martin Wegener, "past achievements and future challenges in the development of three-dimensional photonic metamaterials", Nat. Photon. 5, 523-530 (2011). M. Kamperman, C. B. W. Garcia, P. Du, H. Ow, U. Wiesner. "Ordered Mesoporous Ceramics Stable up to 1500 C from Diblock Copolymer Mesophases", J. Am. Chem. Soc. 126, 14708-14709 (2004). S. C. Warren, L. C. Messina, L. S. Slaughter, M. Kamperman, Q. Zhou, S. M. Gruner, F. J. DiSalvo, U. Wiesner, "Ordered Mesoporous Materials from Metal Nanoparticle/Block Copolymer Self-Assembly", Science 320, 1748-1752 (2008). 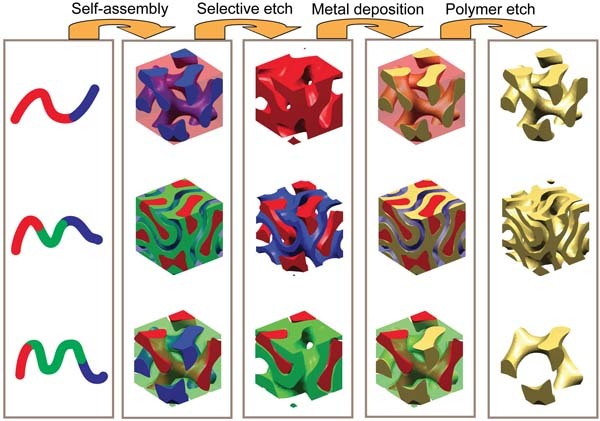 K. Hur, Y. Francescato, V. Giannini, S. A. Maier, R. G. Hennig, U. Wiesner, "Three-dimensionally isotropic negative refractive index materials from block copolymer self-assembled chiral gyroid networks", Angew. Chem. Int. Ed. 50 (50), 11985-11989 (2011). Silvia Vignolini, Nataliya A.Yufa, Pedro S. Cunha, Stefan Guldin, Ilia Rushkin, Morgan Stefik, Kahyun Hur, Ulrich Wiesner, Jeremy J. Baumberg, Ullrich Steiner, "A 3D Optical Metamaterial Made by Self-Assembly", Adv. Mater. 24 (10), OP23-OP27 (2012).